Shirdi Sai Baba Stories,Leelas and Teachings. : Shirdi Sai Baba's Grace-Experience Of Sai Devotees-Part 23. It was on 28th of August 2011 that suddenly clouds of darkness surrounded our house. My father who was hale and hearty, suddenly suffered a massive cardiac arrest and had to be rushed to the hospital. We all followed him in the ambulance. All throughout the way I was praying to Baba. Some how we succeeded in taking him to the hospital at the right time. I was crying continuously as i saw the reactions of all other family members in the hospital. One of my uncles said that my father was serious and the doctors had already declared him clinically dead and will wait for 15 more minutes to totally declare that he is no more, till that time they will try to revive his heart which had stopped beating. 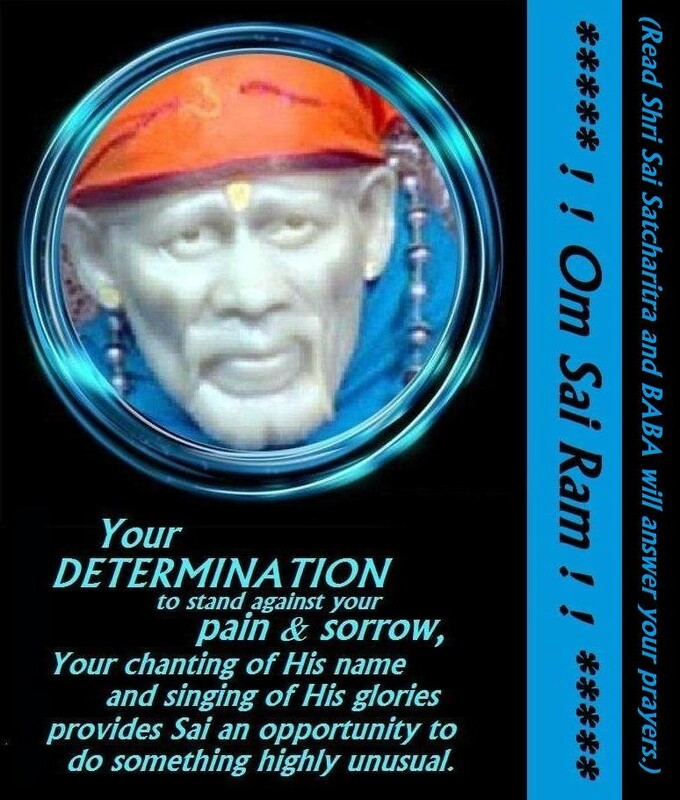 After hearing all this i thought of nothing else but only thought to pray to my Sai baba for my fathers life. After 10 mins I was informed that doctors could find his pulse and they had taken him to ICU. As the moments passed by we were getting more nervous but i had full faith in my Baba,I prayed Baba you will not leave us I know . Next day an unknown lady suddenly came to me and gave me Babas udi and told me to keep it under his bed. I felt that it was Baba's messenger who had come to help me. By Babas grace my father came back to his senses after i had kept the udi under his pillow. Although he was admitted in the hospital for 21 days, he has recovered from the attack. I know this is nothing else but purely blessing of Baba.All this is due to my Sai babas blessings. Sai baba is always there to help his devotees. I love you very much my deva, always be with me my Baba. Om Sai Ram.. Om Sai Nathaya Namaha.. It is a really wonderful and blissful experience to read through the innumerable experiences from numerous Sai bakthas. Sister Manisha, thanks a lot for creating this platform to post our wonderful Sai experiences. 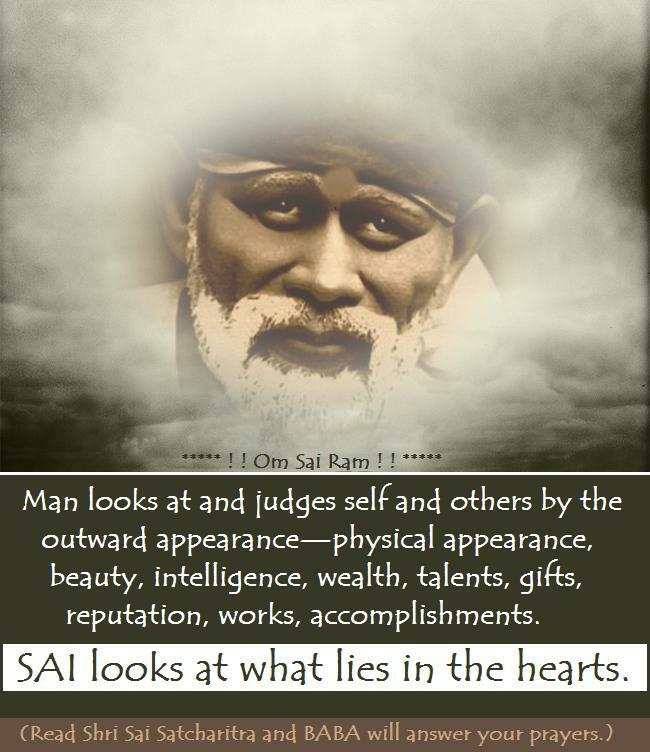 There are several miracles happening in our lives everyday, every now and then, big and small, at the behest (honestly, use of this word 'behest' in itself is a miracle... it just came to my mind, I didn't knew the meaning and when I saw the dictionary I found it perfectly fits the context) order of our beloved Sai Guru. I would like to share one miracle that I experienced today. Today I observed the second week of Sai vrat out of 9 weeks. I intended to go to the Baba temple around noon for Aarti after finishing pooja at home. But Baba had a different plan for me.. I could not go to the temple because by the time I finished pooja it was well past noon and I knew that the temple would be closed after Aarti. Therefore I decided to go to the temple in the evening. When I started in the evening, it started raining cats and dogs and by the time I got into my car I was sort of drenched though I had an umbrella due to my physical disabilities. Soon after getting into my car, I sincerely prayed to Baba (I have a Baba in front of the steering, he always look at me when I drive) that it should not rain when I reach the temple as I will not be able to manage to get into the temple if it rains heavily (SHRADDHA). I think the temple is about 15 - 16 kms from my place and in between there is an underground tunnel for about 8 kms. When I got into the tunnel it was raining so heavily but when I got out from the tunnel there was no rain, however there were dark clouds about to burst anytime. I thanked Baba for holding the rain when I came out of the tunnel, but as I drove a bit farther it started raining very heavily and when I reached the temple gate it was at its best. I prayed again to Baba to consider my plea and facilitate my dharshan. I decided to wait for a while inside the car (SABURI). As I was waiting I received a text from a friend who visited 'Shridi' stating that he had returned (okay, you could also call this a coincidence... but I felt he could have sent this text much earlier as he had returned much earlier than that and therefore thought that Baba is signaling that he is around). After about 10 minutes, the rain stopped completely and I was able to go inside the temple HASSLE FREE. I was inside the temple for nearly 90 minutes listening to 'Vishnu Sahasranamam' and witnessed 'Dhoop Aarti' thereafter. I was hearing heavy down-pour outside during this time. I had two pleas this time - 1. I had done parking violation of my car outside the temple. I admitted to Baba that I know what I have done is wrong, particularly during peak hour and prayed to Baba to forgive me and save me from any hardships (police, penalty etc.). 2. Again there should be no rain when I go back to the car. Trust me, when I came out of the temple after the spectacular dharshan, the rain had stopped and I could walk normally and get into my car and also there were no tickets for parking violation (such a long time during peak hour). The moment I got into the car, it started raining so heavily again. This is just one of the many many clear indications that Baba takes care of even your simplest needs once you surrender to him with all sincerity. 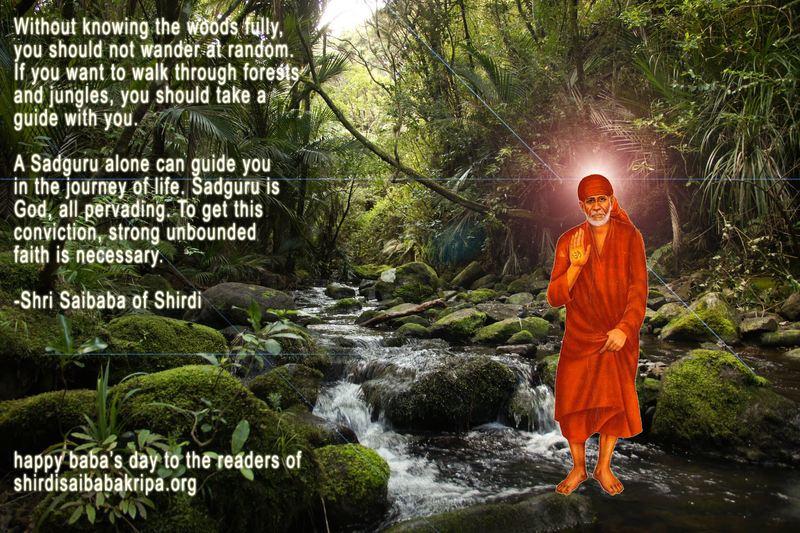 SHRADDHA and SABURI.. these are really magical words in the world of Sai. The above incident is only a small project of Baba, he had undertaken a bigger one for me. Currently he had put me in the testing (patience) phase and he is also driving me to pass through this phase. Iam pretty confident that he will help me succeed very soon. I will soon be sharing the experiences of this great project once the project is delivered by Baba, the director of directors. Baba, please bless all of us with peace, patience, joy, happiness, prosperity and top of everything a heart and home filled with SAI DEVOTION all the time. Many thanks for posting this humble note. Shri Satchitaanand Sadguru Sainaath Maharaaj ki Jai.. I experienced a miracle of Sai baba's blessing.I became speechless for this. Actually as you know I was into total depression from the past 20 days as of the domestic troubles. Even my parents are hurt to very extreme extent. They did a lot of help for my family for which they were blamed very badly. ( I think Baba has some intention behind it.) And I was troubled for this very rudely.Because of these things happening in our life my parents and I are in deep sorrow these days. Though the intensity of the situation came down but there is no solution. I even thought to end up my life with my kids. Though still my mind is not calmed but the days are just passing. I cried and even scolded Baba where are you ?Baba Please help me.I cannot bear all this . Baba always comes to rescue.Listening to our prayer I am sure he has reduced the intensity of suffering. Yesterday morning I had a dream in which there were two slips about me thrown into a dust bin by my left side.It seemed to me as if I am on a stage. And when I turned to right side I found a huge baba's idol just like the one sitting on the stone. And it felt like Baba was very angry on me and He said if you don't want the life I have given to you I too don't want you. That was the intention of Baba on the slips. I felt sorry for that and started doing seva with my mother. I picked some jasmines and started to make it a garland sitting near him. And all of a sudden it turned into a beautiful multilayered mala(Garland).I was surprised at it .I was thinking how do I know to make such a garland just like in Tirupathi for Lord Venkateshwara? Then I put the garland on Baba. And after a while I found a strong wind blowing on the stage from back side of Baba and it threw away my garland. I felt sooooooo sad at what happened and thought why did Baba discard my garland. So is he still angry on me? I again continued my seva to him. Then I woke up from my dream. Its a habit that I see Gods face in the morning as soon as i get up and yesterday morning too thinking of baba I got down from bed .The TV was already switched on by my parents. And to my surprise it was BABA's song going in it. I was shocked but still occupied by thinking of the dream why baba threw the garland? And the day continued very busy because of a ceremony to be performed with baba's blessing. But my thoughts were still haunting around Baba. I felt like going to Baba mandir near by to our home .But I was still held with shopping and all other work .It was 8:45pm and I knew the temple will close at 9:00pm and it was also raining . I prayed to baba please help me to reach to you.The kids were tired and as I was going instead to take a turn to my house I felt a rush to visit baba even if the temple is closed. During all this I had conversation with my mother and I also shared to my mother why did baba do like that in the dream .He knows why I cry and scold him. And still he is that angry on me. Then my mother consoled me and said baba has His own ways. I said sorry to my mother( that you were insulted because of me) then she said ,Baba's love should flow on all of us and all these insults will not even effect us. She said Baba will only take care. I reached there just about 10minutes to 9. I left everybody in the car and rushed inside to the temple. The aarthi was going on and there was a small crowd. I too got involved in the aarthi . Then the pujari ji called me among the group and asked to pick up a tray. He was indicating me by his hands and eyes gestures as the aarthi was going on.I picked up the tray he showed. To my shock he threw baba's garland into the tray and also the garland of Lord Ganesha's and Lord Shiva's. I became speechless.I was very shocked at the timings of baba. I thought If I went that day any other time this wouldn't had happened. See the coincidence of my going to baba and the dream I had.Witnessing all this it clearly indicates Baba's plan behind this and clearing my fear of the dream and His love and presence in our life .I felt peaceful and also felt that Baba is always listening and taking care of us . He is every minute with us in our life and in our thoughts. Baba always blesses his devotees. He will be beside us. Only thing is we need more bhakthi to reach Him. I trust one day baba will bless my parents. All we need is patience though it is hard at the time we face the bad situations but we need to exercise patience. baba plz take care of me and my family and my loved ones family.